We've a host of live events coming up over the next 2 weeks. Tempest Recordings is well represented with sets from Robodop Snei, and his techno alterego Phase 7, Terra Nine, Deep Fried Dub & Hideyo Blackmoon. On a similar vein, deep in the Victorian Bush is the Doofapocalypse festival, decidedly more psytrance orientated, Tempest & Slice provocateur, Tøn will be playing his unique twisted psy sounds. Catch him tonight at midnight. Next Friday, 16th November, in our hometown of Melbourne, Slice will be presenting the fiftth edition of their Nexus events, at My Aeon, 781 Sydney Rd, Brunswick. Featuring a mix of uptempo and downtempo electronic nuttiness, you can catch Tempest artists Red Eye Express, Stickleback, Tøn & Aerobiotic. On Sunday, 18th November, Couch presents the official meet and greet for Banco De Gaia, including an Afternoon chillout DJ set with support from Sunsaria,C-Ravin and Aslan. 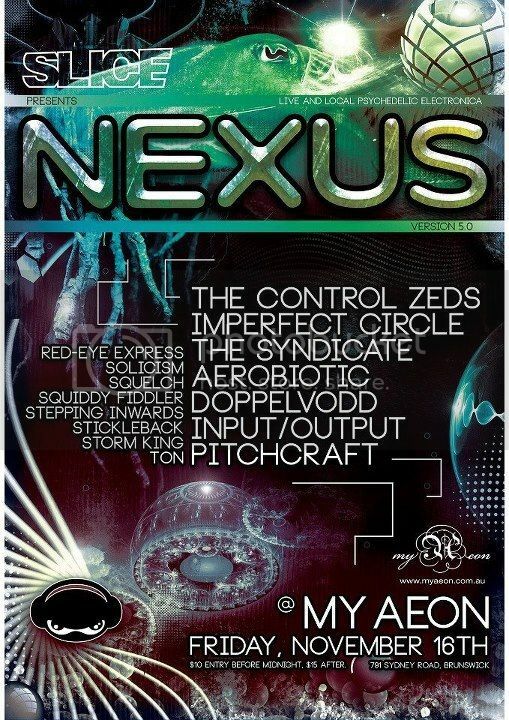 Its at The Palais, 111 Main Road Hepburn Springs. 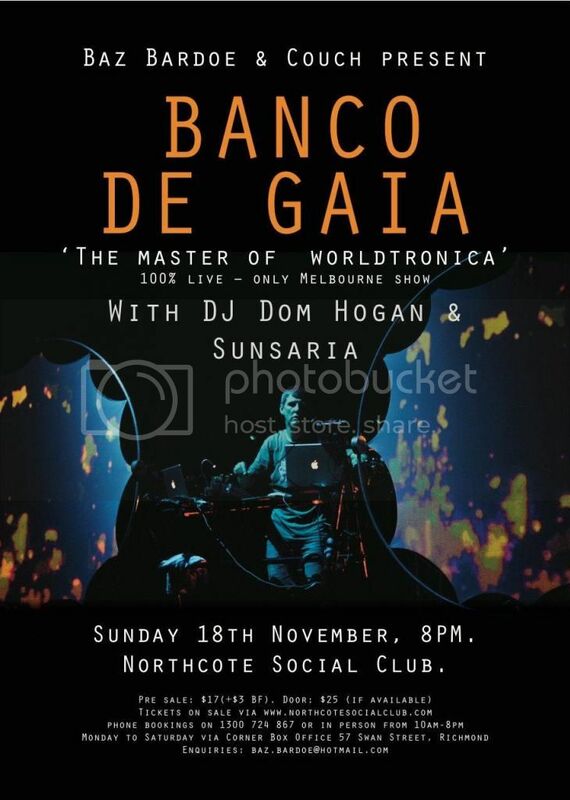 Later that evening legendary electronic music artist, Banco De Gaia will perform his complete live show at the Northcote Social Club. This will very definitely be his ONLY live show in Victoria. Support on the night comes from DJ Dom Hogan and Sunsaria. There will be one live show only from Banco De Gaia due to time restrictions in his schedule. The ticket price has been kept as affordable as possible – just $17 (plus $3 BF) via pre sale. Door price is $25, but there is no guarantee of availability on the night due to limited capacity. Ticketing: Tickets on sale via www.northcotesocialclub.com phone bookings on 1300 724 867 or in person from 10am-8pm Monday to Saturday via Corner Box Office 57 Swan Street, Richmond.